PRISM Omaha's Hummel Park Nebraska investigation was referenced under the in the Halloween 2014 People.com article entitled, "The Haunted States of America: Iconic Ghosts of the Union (Infographic)" written by Alex Heigl. PRISM was written about in a Halloween 2014 article, by Leeanna Ellis, for the Arlington Citizen entitled, "Investigative team probes haunted locations". Makayla Nemecek, Editor-In-Chief of Scribner-Snyder High School newpaper, The Trojan Times, wrote an article entitled, Spirits Continue to Reside at The Old Hotel, about the paranormal activity and investigations of PRISM founder David Pierce Rodriguez and the rest of the PRISM paranormal research team at the historic Harder Hotel in Scribner, Nebraska. Pat & JT Q98.5 After Dark! PRISM director Carl Norgard and lead investigator Kelley Kennedy were interviewed for "Aprilween" 2013 on Omaha, Nebraska's Q98.5 FM on the Pat & JT in the Morning radio show. Several EVPs were played and the PRISM team and Psychic Andy and intuitive healer Elizabeth Myers took calls. Journalist Krystal Sidzyik from the UNO Gateway newspaper wrote an article entitled, UNO’s Paranormal Summit A Frightening and Fun Success. The article talks about the 2011 Paranormal Summit and PRISM's involvement with it. The PRISM team was featured in Southwestern Iowa's The Daily Nonpareil newspaper. PRISM founder, David Pierce Rodriguez was mentioned in Ursula Bielski's new book, There's Something Under the Bed!. In her book Ursula recalls the time when she, David, and paranormal author Troy Taylor investigated the Villisca Axe Murder house and were witness to the children's bedroom door opening and closing on command. PRISM founder, David Pierce Rodriguez, was interviewed in Miami on South Florida's WAXY 790 AM 'and 104.3 FM Sports Talk Radio The Ticket by Alan Strauss and Larry Milian on the 'Dos Amigos' show. Several EVP were played during the interview. PRISM was interviewed for an episode of, Conversations with a Serial Killer, by UK-based Twofour Broadcast.The episode revolves around the Charles Starkweather murders. Several members of PRISM Omaha were interviewed regarding their 2005 paranormal investigation which revolved around the Charles Starkweather murders, in particular, the August Meyer farm. The show will air on the LIVING channel in the United Kingdom. PRISM was featured in the documentary film A Ghost of a Chance by JEK Films. PRISM founder David P. Rodriguez and paranormal investigator Anney Horn were interviewed about their experiences at the Villisca Axe Murder House. The documentary is a behind the scenes look at the making of the film Haunting Villisca by AriesWorks Entertainment. Staff writer Courtney Brummer with The Daily Nonpareil teamed up with investigators from the Paranormal Research and Investigative Studies Midwest (PRISM) for a four-part series on haunted places in southwest Iowa entitled, A Nonpareil Series: Hunting for Haunts. This report focused on investigations conducted at the Historic Pottawattamie County Squirrel Cage Jail and the Villisca Ax Murder House. Some of PRISM's examples of ghost photography can be found in the new book Ghosts From Coast to Coast, written by Kalyomi and published by Golden West Publishers. Ghosts From Coast to Coast is a collection of pictures and commentary contributed by ghost investigating groups from across the country. Pictures were taken "on the fly," without the aid of a tripod or optimum lighting, so put on your "ghost eyes" to have a look at some of the best pictures submitted by the finest ghost investigators in the country. PRISM founder David P. Rodriguez and PRISM investigators Carl Norgard, Dottie Norgard, Dan Christianson and Jon Shrimpton were interviewed for the Omaha's Worlds Of Wayne Halloween 2006 podcast. PRISM's founder, David P. Rodriguez, and PRISM investigator Dan Christianson, were interviewed on Lincoln, Nebraska's KIBZ 104.1 FM The Blaze during the 'Tim and The Animal' morning show. Several EVPs recorded by the team at the Villisca Axe Murder House were played and discussed. A story about PRISM was featured on the front page of the Omaha metro area's Suburban Newspapers. Journalist Jennifer Meyer accompanied PRISM on an investigation of Haunted Hollow on October 19, 2006. PRISM's EVP audio from the Haunted Hollow investigations were featured in several advertisements on KQKQ 98.5 FM and KQCH 94.1 FM in October of 2006. Below is a short Haunted Hollow radio promo that aired in October 2006 feautring several of PRISM's EVPs from our investigation of the farmhouse. Photo credits Carl Norgard and David Pierce Rodriguez. PRISM's investigation of the Amber Harris murder was briefly discussed on America's Most Wanted. PRISM's founder and lead investigator David P. Rodriguez was interviewed on Ghostly Talk paranormal talk radio on Sunday July 16, 2006. Several EVPs from recent investigations were discussed. The new non-fiction book, So There I Was: More Confessions of Ghost Hunters is now in print. Chapter 8 tells the story of Troy Taylor, Ursula Bielski, and the PRISM investigative team's May 7, 2005 investigation of the Villisca Axe Murder house. The book is written by Troy Taylor and Len Adams and published by Whitechapel Productions Press. PRISM Norfolk founder Anney Horn was interviewed by Sioux City, Iowa NBC affiliate KTIV News. The news story focused on her involvement in paranormal research with PRISM. PRISM Norfolk founder Anney Horn was interviewed by journalist Andrea Westerhaus of the Norfolk Daily News (Norfolk, Nebraska.) The article entitled, Norfolkan Pursues Paranormal Activity, focused on her involvement in paranormal research with PRISM. A few of the EVPs (Electronic Voice Phenomena) that the PRISM team recorded at the Villisca Axe Murder house were featured on the About.com Paranormal Phenomena site. PRISM founder David P. Rodriguez and PRISM investigator Ralph DeStefano were interviewed in the studio on Halloween on Omaha, Nebraska's KKCD 105.9 FM, during Steve & Roxy's morning show. Some of the staff from the UNO Gateway newspaper and the Omaha News joined PRISM on their October 22, 2005 paranormal investigation of Hummel Park in Omaha, Nebraska. The article talks about the investigation and, speaks with PRISM's founder and lead investigator, David Rodriguez, about the work that PRISM is doing. The Omaha News aired a news story on PRISM and founder David P. Rodriguez. The story focused on various evidence of the paranormal that they have captured and in particular, their investigations of the Fairview Cemetery and Black Angel Statue located in Council, Bluffs, Iowa. On October 11, 2005, PRISM was featured on Fox 42 KPTM News (in Nebraska & Iowa.) The news story was rebroadcast on Halloween, October 31, 2005. KPTM followed the PRISM paranormal research team during an overnight investigation of the Villisca Axe Murder house in Villisca, Iowa on September 9, 2005. PRISM founder David P. Rodriguez and PRISM investigator Dan Christianson were interviewed on Spicoli's Morning Fiasco radio show on Omaha, Nebraska's KIWR 89.7 FM The River. PRISM founder David P. Rodriguez was interviewed on Ghostly Talk radio. David was introduced into the Ghostly Talk team as a GT field reporter and then spoke about PRISM's Villisca Axe Murder house investigations. Three EVPs from the investigations were played during the interview. Film producer and director Paul von Stoetzel recorded interviews with PRISM founder David P. Rodriguez and PRISM investigator Dan Christianson for his new documentary film with the working title, Roadside Attractions. Locations included both the Squirrel Cage Jail in Council Bluffs, Iowa, and the Villisca Axe Murder house in Villisca, Iowa. PRISM's investigation of Mystery Manor in Omaha, Nebraska was discussed on Fox 42 KPTM News (in Nebraska & Iowa). PRISM's founder and lead investigator, David P. Rodriguez, was interviewed live on talk radio on Wednesday, August 24, 2005. The interview lasted just over an hour and a half. Los Desvelados is a nationally syndicated paranormal-themed talk radio show broadcasting (in Spanish) evenings, Monday through Friday, on AM radio throughout the United States (in over 40 cities) and parts of Mexico. The host of the show is Victor Camacho, also known as "the Art Bell of Latin American radio". PRISM's founder David P. Rodriguez wrote several entries in the Encyclopedia of Haunted Places: Ghostly Locales From Around the World. The book was written by some of the world's leading paranormal investigators, and was compiled and edited by Jeff Belanger of Ghostvillage.com, and published by New Page Books. PRISM was featured in Southwestern Iowa's The Daily Nonpareil newspaper on July 19, 2005. The article entitled Fox 42 To Air Ghost Hunt spoke about PRISM's televised paranormal investigation of the historic Old Pottawattamie Squirrel Cage Jail in Council Bluffs, Iowa. 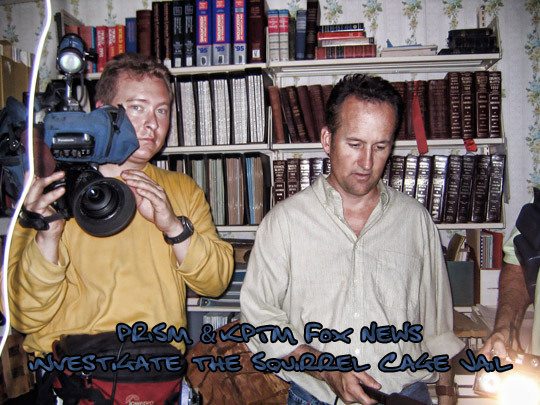 Omaha, Nebraska's KPTM Fox news anchors Taylor Wilson and Tracy Jacim follow PRISM on an overnight investigation of the Squirrel Cage Jail for their "Prime Assignment". Reporter Dave DeJohn and photographer Jason Pressler.